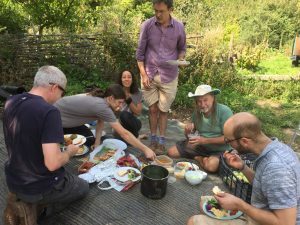 Brighton Permaculture Trust started looking after our -:- plot at Stanmer Organics in 2006 and since the early days there has been the idea for a pond planned into the design. However, it was only when Neil Smith left a donation to the plot in his will that we finally had the money to put the plan into action. The plot team were lucky to find a very high quality liner on eBay at an affordable price. The huge sheet of Bentomat clay liner was probably an off-cut from a larger project, so it’s great to be able to put it to good use. Over the past few months the plot volunteers have worked clearing the area of weeds, shaping, measuring and levelling in preparation for the liner. 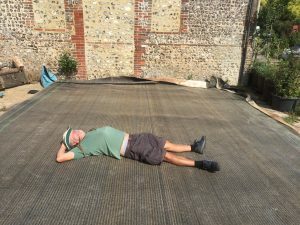 Work was delayed by the exceptionally hot summer, with hard-baked ground (and baking hot volunteers!) making progress impossible for several weeks. 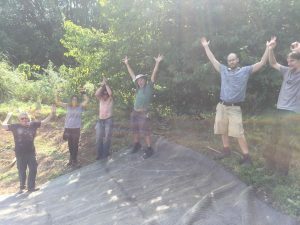 Then, in just one day, a group of determined volunteers from Concordia worked in relentless rain and made massive headway. 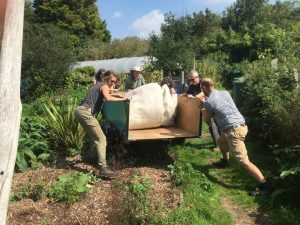 This week a team of dedicated volunteers heaved the liner (which weighed several tonnes) from the barn in Stanmer village up to the site and laid it in place. Thanks to the generous donation from Neil Smith, some good luck in finding the right amount of high quality liner at the right price, the tenacity of the plot coordinators and some serious hard work from our great volunteers, the pond is finally taking shape. Next we will be asking around the other Stanmer Organics plots for any spare pond plants and by the spring the pond will be a real asset to the plot and a wildlife haven. A huge thank you to all our volunteers for all their work to make this happen. 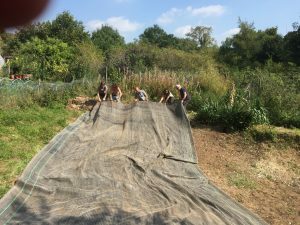 To find out more about volunteering with Brighton Permaculture Trust, visit our -:- Volunteer page.